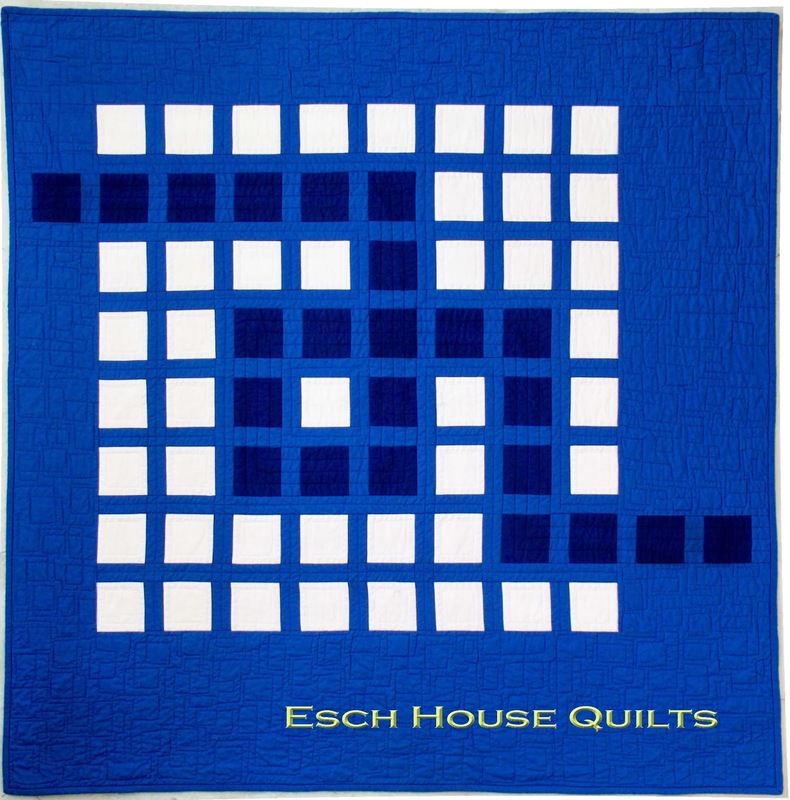 I think most people who make or design quilts get asked where they get their ideas and inspiration. Most of my quilts start with a shape I want to work with and evolve from there. Some are inspired by something I see during my social media/web surfing that I then play with until it works itself into something new. The Follow Me pattern includes five sizes from Baby (39″) to a Full/Topper size (79″). This pattern is a little unusual in that the design doesn’t change from size to size, the pieces just get larger. The Charm Throw size is made using 5″ charm squares and finishes at 73″ square. Both the quilts shown are the Youth size at 48″ square. The remaining size is the 65″ Throw size. Night Forest was made using Robert Kaufman Kona solids in surf, white and navy. Coffee Run was made using the Collage collection by Carrie Bloomston for Windham Fabrics. When I saw that coffee cup fabric, I just had to have it and fussy cut it. In fact, I put off making Night Forest because I was so obsessed with those coffee cups 🙂 Fussy cutting animals or letters would make a really cute quilt for a child too. So that is all about Follow Me! You can get paper copies of the pattern in my Etsy shop and PDFs in my Etsy, Craftsy and PatternSpot shops. Wholesale purchasers can contact me directly at ehq at sbcglobal dot net or order from Checker, Brewer, Petersen-Arne or United Notions. I hope you have as much fun thinking about the possibilities as I did! I loved reading about your process and inspiration as well. 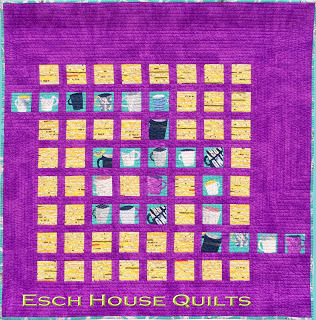 A few times I've had a complete quilt (title and all!) pop into my head all at once. It's super fun when that happens. As far as your borders….I never would have noticed! Either way works beautifully! I love the solids version so much! 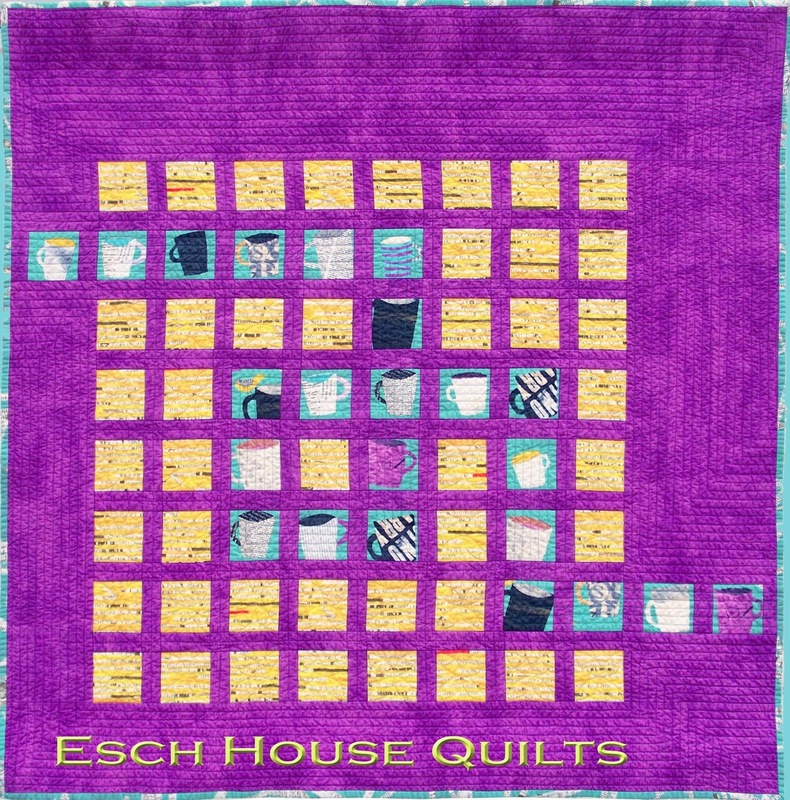 Now people can see what the quilt will look like if they switched the top and bottom borders! How funny you just noticed! This is another beautiful quilt design. As a 'pattern making wanna be', I enjoy and it helps to see and hear others processes! Thank you!